In stock -This product will ship today if ordered within the next 6 hours and 59 minutes. Nature`s Own Evening Primrose Oil is carefully cold pressed and high in gamma linolenic acid. Evening primrose oil (EPO) is produced from the seeds of the evening primrose (Oenothera) family. The oil is high in fatty acids, including the essential omega-6 Linoleic acid and the non-essential omega-6 gamma linolenic acid (GLA). GLA is important in supporting the healthy production of prostaglandins, some of which are precursors to oestrogen, which is why many women regularly supplement with evening primrose oil. GLA is also important in the healthy support of other prostaglandins that act in the vascular and immune systems, as well as in muscles. Taking Nature`s Own Evening Primrose Oil supplies the body with a source of preformed GLA. Evening primrose oil, capsule shell comprising of: glycerine; gluten-free starch; gelling agent (carrageenan), and acidity regulator (disodium phosphate), antioxidant (tocopherol-rich extract). Take 1 vegicap daily as a food supplement or as directed by a practitioner. Below are reviews of Natures Own Evening Primrose Oil - 90 x 500mg Vegicaps by bodykind customers. If you have tried this product we'd love to hear what you think so please leave a review. 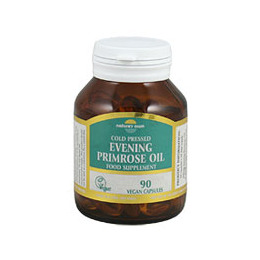 Nature`s Own Evening Primrose Oil is carefully cold pressed and high in gamma Linolenic acid. Healthy individuals can make GLA from Linoleic acid.